Visiting County Mayo? 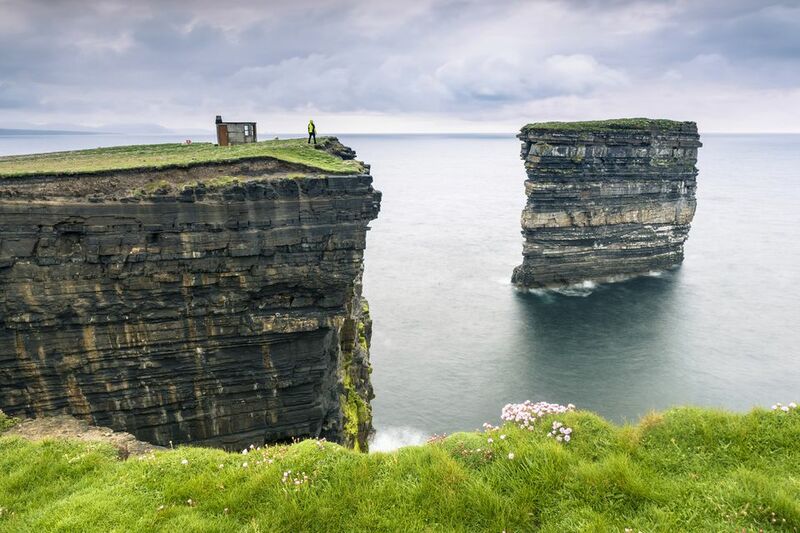 This part of the Irish Province of Connacht has a number of attractions you will not want to miss. Plus some interesting sights that are slightly off the beaten path. So, why not take your time and spend a day or two in Mayo when visiting Ireland? Here is the background information you need, and some ideas to make your visit worth the while. The Irish name of County Mayo is Contae Mhaigh Eo. translated literally this would mean "Plain of the Yew". It is part of the Province of Connacht and uses the Irish car registration letters MO. The County Town is Castlebar, other important towns are Ballina, Ballinrobe, Claremorris, Knock, Swinford, and Westport. The size of County Mayo works out at 5,398 Kilometers square, on which a population of 130,638 live (according to the census of 2011). Achill Island is the largest island off the Irish mainland - though the narrow Achill Sound and a sturdy bridge may create the impression that you are on a mere peninsula. There is only one main road from Achill Sound via Bunacurry and Keel to Keem, but what a road this is. After Dooagh you'll be driving with the mountains to your right and a sheer drop to your left, arriving at secluded Keem beach. From which a challenging climb will bring you to the top of Croaghaun, 668 meters above the sea at the summit, featuring one of the highest cliff faces both in Ireland and Europe. Take the Atlantic Drive past the tower of pirate queen Granuaile, or explore the deserted village on the slopes of Slievemore (672 meters). Or have a gander at the small cottage where Nobel laureate Heinrich Böll used to live. It may not be Ireland's highest, but certainly holiest mountain - at 765 meters Croagh Patrick towers over Clew Bay and may be climbed from Murrisk. Just follow the well-worn way, which is a challenge even to experienced hill-walkers. Loose scree and steep inclines make the "stations" (where you are supposed to offer prayers) a welcome resting point. Just be aware that when the path levels out on a ridge (great views from here) you are nowhere near the top. And the hardest climbs are still to come. By the way - the National Famine Monument is nearby, depicting a "coffin ship" (as those ships used for mass emigration in the mid-19th century were known), complete with skeletons in the rigging. Though John Behan's sculpture more than often reminds me of a Spanish galleon. The small country town certainly has a unique atmosphere and welcomes the visitor with open arms and open pub doors, out of which traditional music may often be heard. Nice urban architecture, a general old-time-feeling and a(mostly) unhurried pace of life combine to make you just want to relax for a while here. And why not. Westport House, just outside of town, is a lively family attraction complete with pirates. John Wayne, the hero of horse operas... falling in love with Quasimodo's Esmeralda? In Cong, it happened, at least according to the script of "The Quiet Man", starring flame-haired Maureen O'Hara and the Duke. Maybe the one "Irish" movie most Irish-Americans will remember and the Irish movie location attracting most visitors. Still a boost for tourism in the small village between Lough Mask and Lough Corrib. Though the enchanting Ashford Castle (today used as a hotel, but you can walk the grounds without being a registered guest) and the ruins of Cong Abbey might be more worthwhile attractions if you are less of a cinema fan. The Ceide Fields are around 1,500 hectares of preserved farmland - which in itself would be nothing to write home about, but they stretch back to prehistoric times and were later covered by bogs. After excavation, they are now the largest stone age monument worldwide, consisting mainly of field systems, enclosures, and megalithic tombs. The interesting visitor center near Ballycastle tells the story in full. Knock, right in the middle of nowhere, has been one of the focal points of Catholic worship since 1879 when locals saw a massive apparition involving not only the Virgin Mary but also St. Joseph, St. John the Baptist and assorted angels. Today it is one of the important Marian shrines in Europe, less known than Lourdes, but nonetheless attracting about one and a half million pilgrims a year. Plus loads of more secular visitors who may be stunned by the sheer size (and at places garish commercial exploitation) of the shrine and its religious environs. There even is a massive, purpose-built airport nearby, conceived by Monsignor Horan and offering direct flights to other important religious sites. The only part of the National Museum of Ireland not situated in Dublin, the National Museum of Country Life at Turlough is a modern development showcasing rural life between 1850 and 1950. Nostalgically deemed to be the "good old times". They weren't. Unless you were a well-off landowner. Parts of the exhibition might be quite sobering. Visiting County Mayo and stuck for something to do in the evening? Well, you could do worse than head out into a local pub (which, bey default, will be an "original Irish pub") and then join a traditional Irish session. Why not give it a try? Louisburgh -"Bunowen Inn" and "O'Duffy's"
Westport - "Henehan's", "Matt Malloy's", and "The Towers"